Begin your Search for Tennessee Lake Front Property on Norris Lake. No matter where you go, Lake Communities are in high demand. At Norris Lake in East Tennessee you can expect days filled with spectacular endless views and miles of ever-changing shoreline. A wonderful place for the perfect lifestyle. Lake living in Tennessee is the perfect choice for you and your family. Call today and schedule a personal tour of vacation lake homes on Norris Lake! Norris Lake, Tennessee is well known for its' natural beauty and perfect harmony. The location provides easy access to the mountains, wilderness, water and moderate climate. Whether for investment, retirement, or a vacation getaway, Lake living in Tennessee is the perfect choice for you and your family. If you are new to the Norris Lake area and are planning a visit please check out our Norris Lake Travel Guide to help with all the information you need to plan your trip. Our travel guide includes information on vacation rentals, lake marinas, photos, videos, maps, state parks, museums and more. Let us help you plan your visit and get the most out of your experience! Schedule your appointment today for a free lake home search and visit any waterfront community on Norris Lake. Today lake home buyers want a variety of choices to meet their individual tastes and lifestyles. Norris Lake Living is designed to provide lake home buyers a unique experience as well as detailed property descriptions on Norris Lake Real Estate. Site visitors can expect high quality digital photos, virtual tours and videos. Thinking of buying a lake house or lake property on Norris Lake? 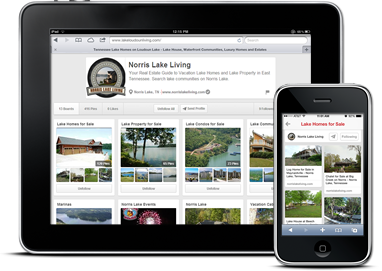 Whether your looking for a place to retire or for a vacation home --- sign-up today to receive a free lake home search on Norris Lake. Personal tours are also available for visitors interested in Norris Lake Real Estate.